Action photography isn’t a huge focus for me. The folks who do it for a living have highly specialized gear so they can work in low light and get a razor sharp focus on the core moment. They spend hours standing around in arenas with bad sound systems trying to find some order into the chaos of a fast moving sport. 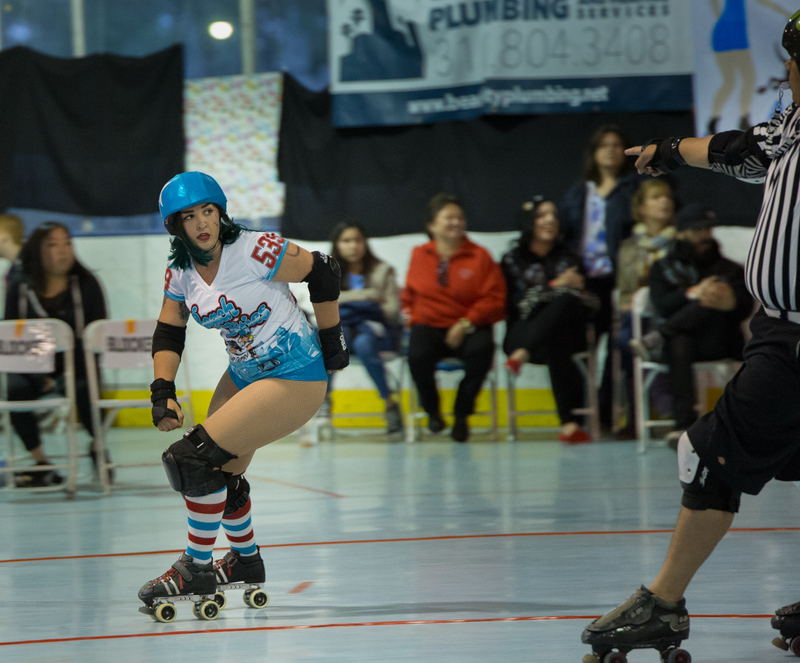 But doing sports photography right is a superb skill and last night I got to try my hand at one of the toughest sports challenges there is, roller derby. From a photographer’s standpoint, there are a few key challenges: seeing and getting the key moment in focus and using technique to tell the story. Action photography is all about story; capturing the moments of human experience. But how do you get the story into a shot? Here are a few Photography 101 ideas. 1. Shoot a LOT. The pros put the camera on continuous shoot mode and then get wall to wall coverage of each key moment. 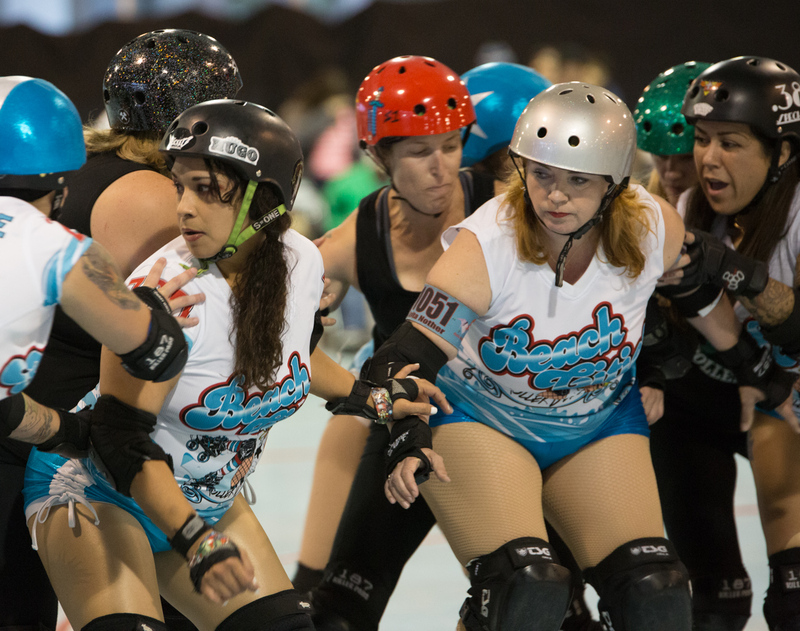 A sport like roller derby is just too fluid to see it all in real time. Plus whoever you’re focused on in that moment will have about 15 facial expressions in that 2 second time frame, from brain dead to blinking to distracted to fully engaged. Shooting a lot also allows you to look at the group dynamics in each shot and pinpoint which shot is central to the story. 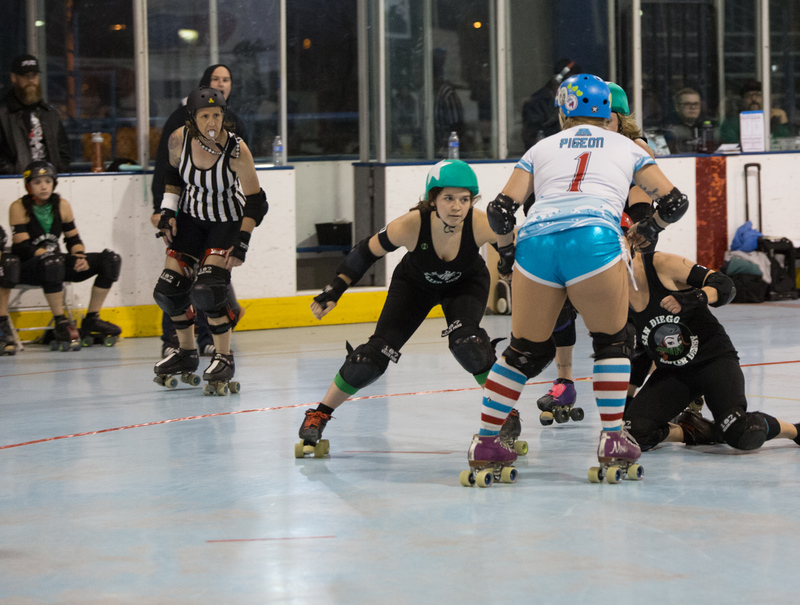 For example here’s a sequence that shows one of the San Diego jammers trying to get past the Beach Cities defender. Here the scene is just starting to unfold. The ref is moving into place. 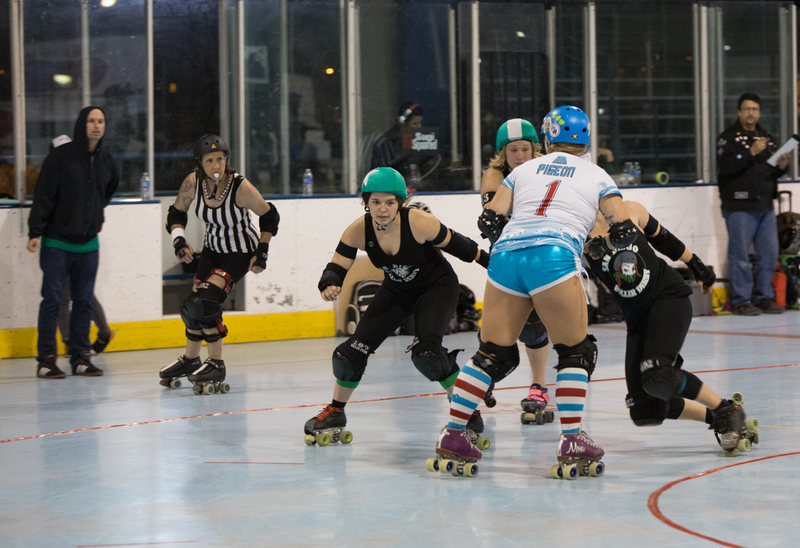 But the jammer (teil green helmet with a star) is hidden by her defenders. Now in shot 2, our intrepid jammer comes out looking for the opening. But Pigeon won’t be easy to get past. Now it’s jammer vs. defender, mano a mano (as it were). And, of course, this shot has been cropped to point the action around the defender in blue. 2. Crop. The idea is always to crop by zooming, right? To give the best level of resolution. But that’s not always possible. And lots of folks don’t realize that the crop is the easiest tool to get rid of distractions, define the compositional elements and capture the human moment. Not a bad image. I like the dynamic between jammer and ref. But I was half way around the rink so notice how much clutter there is. I’ve set the F-stop to 3.5 to pull my subject away from that busyness. But that big sign is still stealing focus and so are some of the audience members. Just this basic crop pulls the composition together. Our heroine is squarely in the Rule of Thirds sweet spot. And the crop allows us to see what she’s feeling so much more clearly. I also cheated just a bit. I darkened the background in Lightroom. Now there’s a story here. 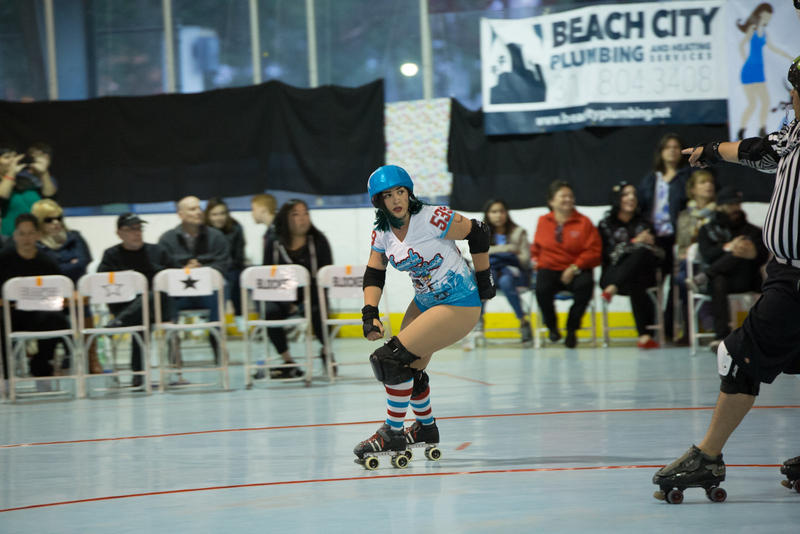 The Beach Cities jammer has just scored a point and she’s looking over at the pack to size up the situation. 3. Make a choice. One issue many photographers don’t do is make the hard choice. People toss all kinds of crap onto their Flickr sites and if the audience doesn’t see any difference between shot 1, 2, 3 and 4 they will get bored. For example here are two moments when the two teams are in a densely packed scrum. Here the Beach Cities gals are trying to keep the San Diego jammer (behind on the far left) from breaking through. The shot shows the physical dynamics fairly well and it’s good enough to post. With this shot the stakes are higher and I cropped in closer. The jammer, umpires and half the team have been cropped out. That means a simpler shot that’s more focused. 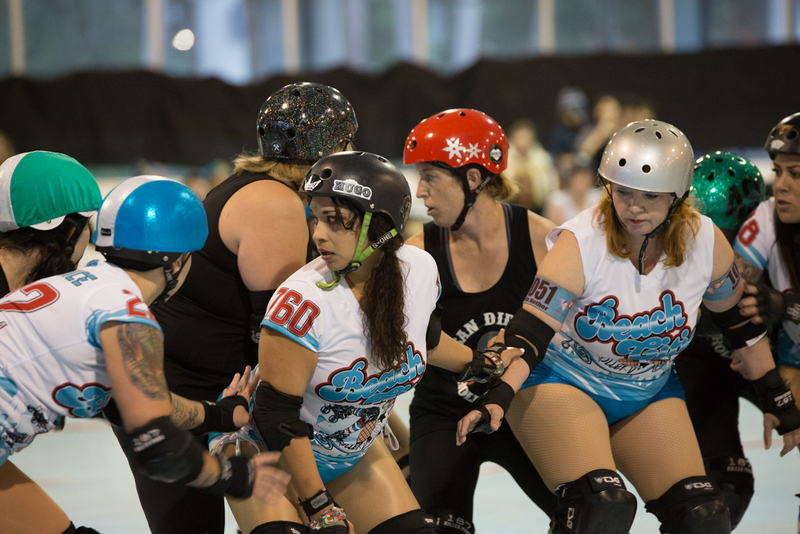 And the chaos of roller derby is stripped away to show a personal moment for each woman. Great post and cool photos. I have only taken riding action photos and ice hockey. Personally, I love photo posts telling stories by themes.